Today’s Creature Feature comes from a truly disturbing set of Alphabet pictures I stumbled across. And since I started the Creature feature last week this inspired me for my posts now; and future creature features blogs. Nothing like a good old Bug hunt ! Especially when the bugs are ten foot long and 800 pounds of acid spitting fury ! The Ankheg is a burrowing predator that lurks underground waiting for prey to get close sensing it with its tremor sense. Then it bursts out of the ground akin to a giant Ant Lion and grabs its victim and pulls it underground to be eaten in its burrow. Honestly being munched on by a 10 foot long magical beast of a bug is not the most glorious way to go. But do not dispar if one of theses nasty critters punches your ticket. You are just one of the legion that have died to this bug over the years. This little baddie has been chewing up parties for closing in on 40 years ! You are not alone fellow adventure, and if you slip its grasp and think you have gotten away. The Ankeg has one more surprise up its sleeve for you. The Ankeg can spit his acidic stomach acid at the adventure and can strike with it out to thirty feet! 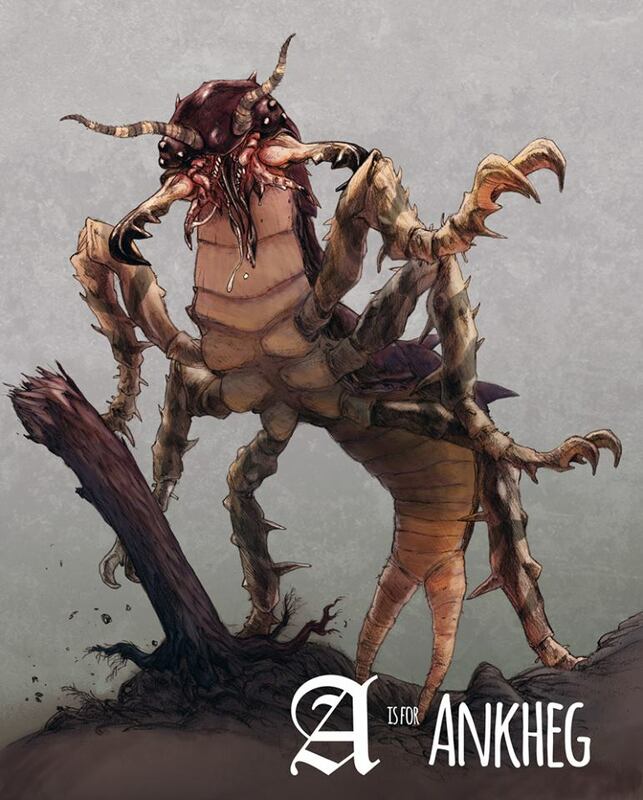 Face an Ankheg unprepared, If you manage to break free of its huge mandibles.. chances are you might just die tired with acid wounds. The adventures are hired by a local rancher to figure out what or who has been killing his cattle. As the party investigates they find mounds of stirred up dirt in the fields where the cattle has gone missing. A cluster of 2-4 Ankheg have made this unlucky Cattle owners fields their new hunting grounds. Next postBugbear & Barghast’s, Oh My! Creature Feature indeed looks like a mini dragon does it not? Have you been to the PL yet?